VET is recognised across Australia. VET programs can give you the opportunity to gain core skills for work and, in some cases, complete training in industry through workplace learning. If your educational program does not include four ATAR courses in Year 12, you will need to complete a Certificate II qualification or higher to achieve your WACE. 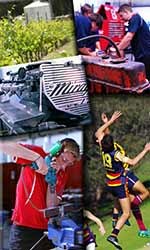 Manjimup Senior High School offers Certificate II qualifications in Sport & Recreation, Business, Childcare Community Service Work, Graphic Design, Hospitality, Agriculture, Automotive Mechanical, Manufacturing (Furniture) and Engineering Metals Fabrication. You can also begin training for your career while still at school by undertaking a VET qualification. Among the range of VET programs on offer are school-based apprenticeships and traineeships. For more information on VET courses click here to visit the MySkills website.